My personal philosophy is that no challenge is too great, no project too small, and no detail too trivial. Louis Sullivan had it right. Form really does follow function and that certainly applies to my approach to interior design. You see, while many designers simply select furniture and paint, I start from an entirely different perspective. How does the space function both efficiently as well as elegantly? I often work with architects (or redraw blueprints myself) to address issues such as traffic flow, door swings, ingress/egress locations, room adjacencies, lighting plans, grand vs. intimate spaces, and more. Look, with building costs at or near $300 sq. ft., you deserve space that lives up to its potential from every standpoint. That's why I make sure every square foot counts. All too often, large interior design firms ride the coattails of a big name designer and then have juniors perform the actual work. When you hire me, you get me. I take full responsibility for all of my projects. I am always accessible and totally hands-on. And I am incredibly detail-oriented. Most importantly, I understand that the ultimate success of a project depends upon my fruitful collaboration with you, developing a very personal relationship along the way. After all, it's your home, your lifestyle, your dreams... your soul. And my clear insight into that is paramount. While I am a solo designer, I also believe in the benefits of creating a well-rounded team at the onset of a project. Otherwise, the 'right hand' doesn’t know what the 'left hand' is doing. 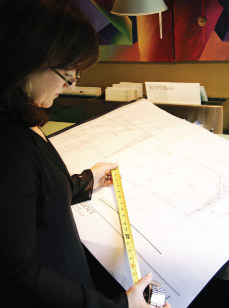 Ideally, the team would include myself, the architect, the landscape architect, and in many cases, the builder. This way, you get each area of expertise working together to solve potential problems... long before they turn into expensive problems. I strongly believe that every member of the family should feel like the design of their home takes their needs and wants into consideration. I am particularly sensitive to what the 'man of the house' will appreciate. I often try to make sure he gets special treatment in areas important to him, like finding space for an oversize water closet or creating a dramatic view from his home office. Of course, I also think about things a woman will value such as a small, discrete sink in the makeup area. Or a second door to the master closet that allows an early riser to leave without waking up the person sleeping. The fact is, I love coming up with solutions that create 'needs and wants' people didn't even know they had!